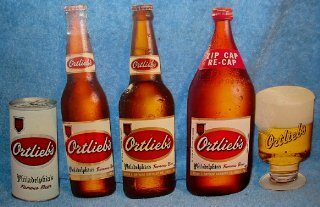 Ortliebs Beer die cuts; Lot of 5 different, lightweight cardboard Ortliebs beer containers. Includes a quart bottle, pint bottle, 12 oz. bottle, 12 oz. can and a glass. Bottles are 9 1/2 inches high. All in great shape with no creases. Plain white backsides have some minor soiling. The light area on the top of the left most bottle is just flash glare.